One of the choicest summer blooming vines, this is a red form of the classic hummingbird magnet, blooms all summer with all the fine attributes of the traditional radicans. Hummers may decide to set up housekeeping in the thick foliage. 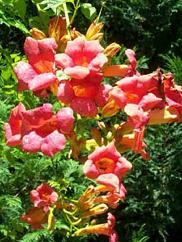 All summer, this hardy vine bears large, trumpet-shaped, bright orange flowers attractive to hummingbirds. 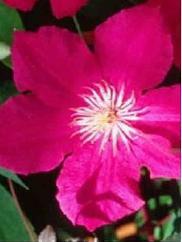 It is easy to grow in ordinary soil in a sunny spot and is pest-free. It needs no fastening to cling to any support, making an excellent screen on a fence or wall. For sensational big blooms in a range of gorgeous colors, our varieties can be trained on arbors, walls, fences, or use them for screening a spot that�s not so pretty, or to cover stumps or climb on poles. 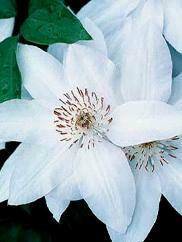 Clematis vines grow 6�12' high, and take from 2�3 years to become fully established. Our experience is that vines grown in full sun will produce heavier blooms for a shorter time period than those grown in partial shade where blooms won�t be as heavy, but will extend over a longer time. 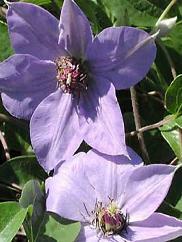 Clematis will benefit from shade over their roots; do this with annuals or shallow-rooted perennials. 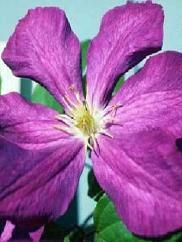 Don�t use heavy bark or leaf mulches in summer as they can promote Clematis wilt. Keep the moisture level of your vines even�never very dry or very wet. 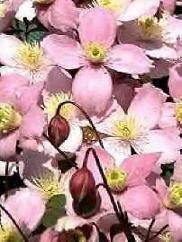 Pale pink 1" flowers are produced in early summer on red stems and the young leaves are tinged purple. Beautifully covers unsightly structures, carports, or fences over an area as large as 20�30'. WOODEN TRELLIS INCLUDED. 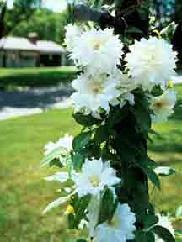 Sweetly scented, creamy white 1" blossoms in great profusion from late summer on (August�September). 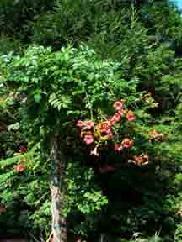 Vigorous and easy to grow, this old-fashioned vine blooms on new wood, and later forms silvery seed heads. WOODEN TRELLIS INCLUDED. Reddish-orange, trumpet-shaped flowers opening to yellow first appear in May and continue to bloom off and on until frost on this very vigorous native vine. Use it to climb and screen a porch, trellis, pergola, archway, wall, or fence. This Honeysuckle is aphid-resistant and an incredible hummingbird magnet. We have seen them nest in the thick foliage. 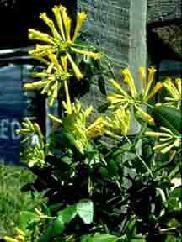 Solid yellow tubular flower clusters run on a fence or trellis from May through the summer. This old Virginia native vine is named for the colonial botonist John Clayton, and was found in a churchyard, dating from the 17th century, in Gloucester, Virginia. 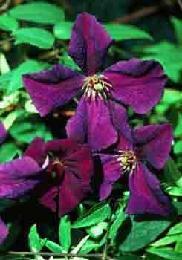 Semi-evergreen, you will want to prune out flowered wood of �John Clayton� after flowering. 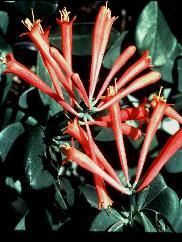 It grows in any fertile, well-drained soil, in sun or semi-shade, and we promise the hummingbirds will find it. 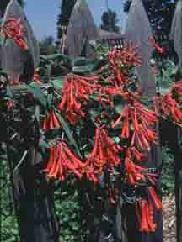 Solid red tubular flower clusters run on a fence or trellis from May through the summer. This is an old Virginia native vine and was found in a churchyard, dating from the 17th century, in Gloucester, Virginia. Semi-evergreen, you will want to prune out flowered wood after flowering. It grows in any fertile, well-drained soil, in sun or semi-shade, and we promise the hummingbirds will find it. 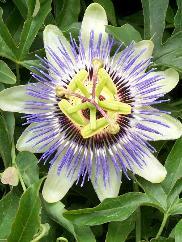 The exotic blooming Passion Flower Vine handles a minimum temperature of 45 degrees and thrives as a container plant in the full sun it loves best. 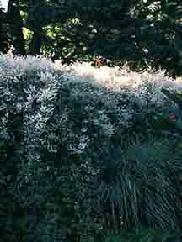 Breathtakingly beautiful with its sky-blue corolla against fringed-white petals, it blooms profusely, has a soft fragrance, and sports shiny, green, attractive foliage. Flowers are followed by yellow, egg-sized fruits. Because they are such rapid growers, Passifloras require periodic applications of fertilizer when grown in containers. 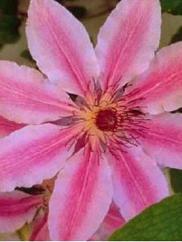 Grown in the ground, low fertility soil is preferred so that flowering is encouraged and abundant foliage discouraged. Glossy green leaves with turning tendrils need support to climb. WOODEN TRELLIS INCLUDED. One of the fastest growing vines there is, expect 12'�15' of growth the first year. Use it to cover arbors, fences, old buildings, or a barn in no time. 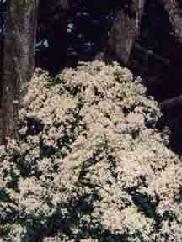 It produces masses of tiny fragrant white flowers from July through September. This vine will do well in sun or shade.